With the weather warming up, everyone’s mind is turning to growing things. And there is nothing more satisfying than growing your own food. Recently my friend Alison Keller sent me a message on Facebook asking for my advice on starting a small garden in her backyard. By the way, Alison and I used to co-host a morning radio show in Charleston, SC. Lots of laughs and a lot of fun while it lasted. Alison is still in the business if you need a talented female voice. Her website is http://alisonkeller.com. I suggest that anyone who is starting a garden for the first year to start small. 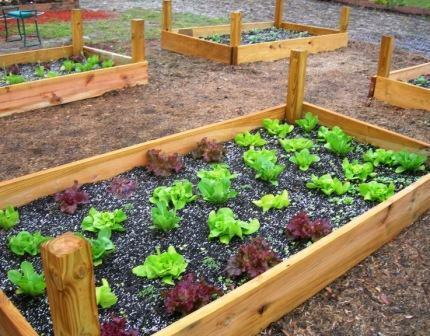 Raised beds is a good way to go for many reasons. 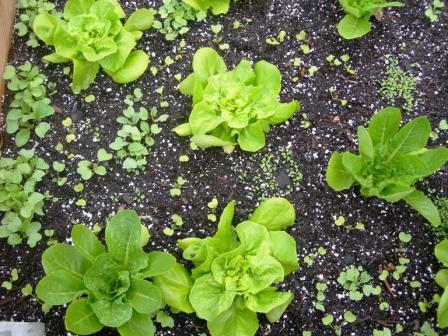 It’s easy to control the weeds and will grow a lot more veggies in a much smaller space. I used treated lumber after researching what kind of boards to use. It has been determined that its ok to use treated lumber in building raised beds, but you can use cedar or redwood. Begin by cutting the 2 x 12 boards into two sections-8 ft. and 4 ft. This will give you the boards for both sides and the two ends of each rectangular bed. Cut the 8 ft. long 4 x 4s in half. Now choose the area of the yard where you want the beds to be placed. 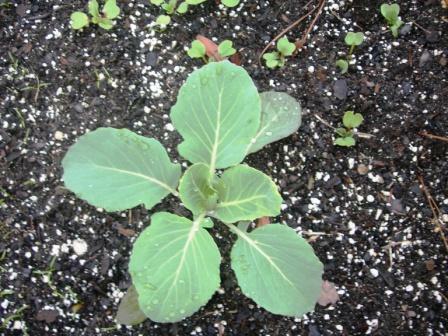 Remember that most vegetable plants need at least 8 hours of sun each day. In other words, don’t put them under a shade tree just to keep yourself comfortable. Measure a 4′ by 8′ plot. Dig up any grass or weeds that are in the area. Next using post hole diggers, dig four holes two feet deep for the corner posts. I decided to put in these corner posts after seeing these online while I was doing my research in January. As soon as I saw these corner posts, I thought about how I could use them to mount a drip watering system for the beds, or I could attach tarps to cover the plants from frost (which I had to do night before last), or I could attach some sort of material to shade lettuce from the intense sun, therefore extending my growing season. Hmm? Maybe a seat to relax while gathering my fresh vegetables? Sorry-I digressed. Some say that you don’t need to set the corner posts in concrete, but I preferred to do so for the extra support. Set the 4′ posts two feet deep in the soil and leave 2′ above the ground. Fill the holes with water and then pour half a bag of Quikrete into each hole and cover with dirt. Be sure the posts are leveled and squared. You’re done for the day since the concrete needs to set for at least 24 hours. Go have a beer and dream of enjoying your fresh vegetables. The next day you can begin to construct your beds. Nail or screw the boards to the corner posts, making sure the boards are leveled. You may need to trench out a small amount of dirt to make the boards level. Now you have a 4′ x 8′ bed that’s 12 inches deep. Next, lay heavy cardboard on the ground as a means of weed prevention. Do not use plastic in the bottom of your bed because water will not be able to drain. You’ll need to fill the bed with a mixture of compost, top soil, and potting soil. 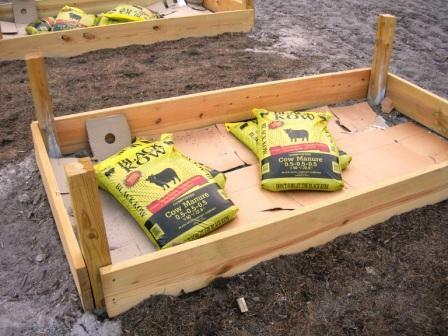 We mixed in some Black Cow compost, too. Now that’s some good s***! We put in a little lime based on the advice we were given. You will need at least 8 to 10 inches of soil. This can get quite expensive, but it’s worth it since the soil is what makes the perfect vegetables. Now you’re ready to plant. Decide what you want in each bed and plant away! We used some transplants as well as seeds. Do a little research about plant combinations as well as spacing. 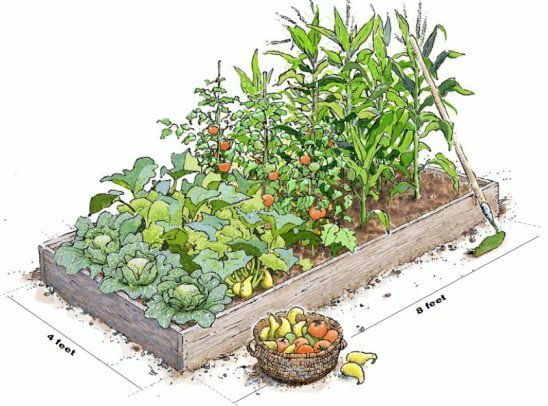 Just google raised beds-images-and you’ll find plenty of pictures and diagrams like this one. Just experiment and have fun. That’s what I’m doing. Jane and I have a large garden but you can grow a lot of vegetables in two 4′ x 8′ raised beds. Plenty for you and your family and even a few friends. If you’re thinking about doing this, then you need to get on it since planting season is nearly here. 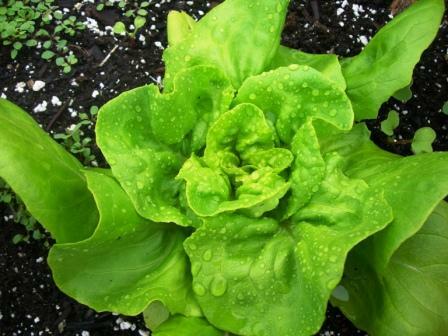 We are already enjoying the lettuce from our raised beds. 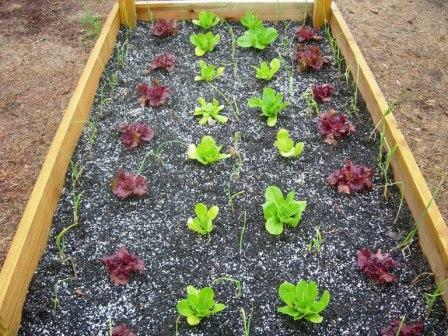 Romaine and butterhead lettuce, radishes, and arugula are in this bed. I hope this helps, Alison, and anyone else who is reading this. I’m by no means an expert, but we’ve enjoyed success so far. Leave any questions you have in a comment below. Fresh clean and pure Friday at la bella vita. There are (destructive) squirrels and lots of birds in the area what would be the best form of protection for the garden so we can feed our family without feeding them to other critters? I tried feeding the birds and providing water thinking they would leave my fig and mulberry tree alone. It was useless. Hi Marci. I really don’t have an answer for you. We put up a fence to try to keep the deer out, but I don’t know what to tell you about the critters that are bothering you. I guess they need to eat too. I love gardening and am very interested in having my own vegetable garden. This is such a timely and excellent post…I’ve been thinking about gardening all week. What a great inspiration. It looks like the raised beds are much easier to work with because you don’t have to bend down as much. I had considered doing raised beds this past spring but when a family member gave us a tiller, I decided to not invest in raised beds. These look great! I can’t wait to grow our own goodies…… now if I could just remember to water things. it took me a full week…but I finally made it here! thanks so much for linking in ! I am happy to have met you…and I am now a new follower! I am so sorry it took me so long to get here. sometimes being a single mom…makes for a bad comment reply blogger! Thanks for sharing this great post on raised beds. It is being FEATURED on my Fresh Clean and Pure Friday get-together now and I hope that you will stop by and share another great post again! Thanks for sharing and happy gardening! What a great post! I am going to take your advice and get moving on a garden this year. 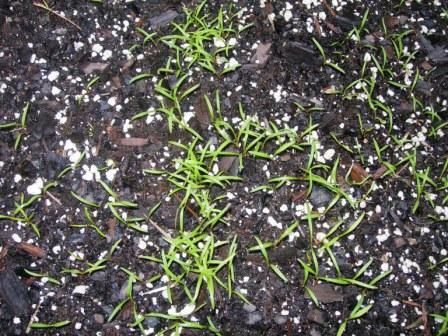 I am so jealous that you already have plants coming up – up north here it was a high of 35 today. Thank you so much for this post! I am going to save it and show it to Dan as I want to make an herb garden off of the kitchen mud room, so that fresh herbs are right out the door! This post will be very helpful, thank you! Calling by from Tootsie Time as participating in Fertiliser Friday and really enjoying meeting everyone else. I have come across this idea before and believe it works well. Great post! My husband and I were just talking about increasing the size of our vegetable garden. Hi Jane, I’m now following you back. I’m so glad that you found me over at Tootsies! I live in Abbeville/Greenwood, SC just north of you. My husband built 6 wonderful raised beds about 4 years ago and we’re ready to put in 2 more as our garden continues to grow. I’d love it if you would link up this post for my weekend blog hop going on right now. I feature 5 blogs every week and one theme is gardening that I always look for. This would be a great addition for my readers to learn about you. Glad to have ‘met’ you! Wow….impressive…….and such a better way to garden…and probably easier once you get your beds set up. Just became your newest follower and look forward to watching your crop come in…. I am impressed with your nice garden but even more impressed that you were a radio show host! Love the city of Charleston. I lived in neighboring Savannah for years. The two most romantic cities in the U.S. if you ask me! Hi Jane, You did a great job on your beds. My husband built 9 raised beds for us over the past few years and that is where we grow our vegetables. Too cool and wet yet for us to plant, but I will be starting some seeds inside soon. First, thanks so much for coming by..I do appreciate your comment. Next, these beds are awesome. We tried container gardening last year without much luck..not really sure why. Just not very good farmers. Thank you for visiting my blog and introducing me to yours! The garden tutorial is wonderful. The rolls from pioneer woman look good too! I am your newest follower. Hi! Jane, I am so glad you found me so that I could find YOU! I want to start a garden this year and I may be a little too late…the garden on this property is a MESS, just like everything else was when we purchased it. I am going to read over your blog and learn a lot about gardening I am sure! Leo, you make it look so easy. When and if we move we will definitely give this a try. Oops! I said, “Leo,” but I thought I was talking to Jane! Where is my mind??? I called another friend of mine Amber whose name is April, and I also called my friend Jemm, Tammy. I hope they (and you) are still speaking to me. LOL! It’s been a long, long day. SO sorry. How can I just come on here and disgrace myself in my first post on your blog? Easy… blame it on my brain which is in the “pause” part of life. 😉 But Leo, I do love your garden. Leo! I am sooooooo impressed. Goodness, this is just amazing. Oh, how I wish I was talented enough to grow my own veggies. My parents used to have a big garden when I was a child growing up, but I have a brown thumb. But lady, I am impressed BIG TIME with yours! Love your blog. And I love and adore Charleston. Such a lovely place. Beautiful raised beds and great tutorial, too! I’m so looking forward to working in the dirt again…go away, snow! Thanks so much for stopping by and following my blog…I am a new follower, too! That helps a lot. I bookmarked it for reference. I hope to at least start container planting a few things this year but may be able to put in one raised bed. Thanks. 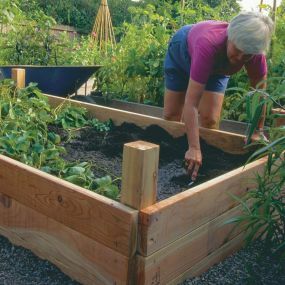 I have always wanted to try raised beds…..I usually just have a big garden until I constantly fought with keeping the deer out a few years ago. Last year I started a Lasagna Garden for the first time. I am working on getting it ready for this year, if it ever warms back up again!. Thanks for sharing….